Gravity Falls airs its series finale tonight, February 15, and as sad as that event may be, creator Alex Hirsch and crew deserve many kudos for going out at the top of their game. Despite an extremely haphazard broadcast schedule, Gravity Falls has transformed from a quirky monster-of-the-week show to an ingenious allegory about the terrors inherent in growing up. Nowhere has that been more apparent than in the show’s final episodes, the Weirdmageddon trilogy, in which sinister supernatural triangle Bill Cipher rips reality apart, resulting in a beyond-nightmarish scenario for twins Dipper and Mabel Pines and friends. Speculation about the series finale runs rampant online, with fans spinning theories from clues, possible red herrings, and the encrypted messages shown at the end of every episode. Tonight’s extended final effort, “Weirdmageddon 3: Take Back The Falls,” has about a hour to solve these mysteries and put the universe back together again. In anticipation of the finale, Hirsch—who, in addition to creating the show, voices the Pines’ Grunkle Stan and Mystery Shack employee Soos—spoke to our own version of Dipper and Mabel: A.V. Club offspring and Gravity Falls fans Nina and Theo. To kick off their journalism careers, the third-grade twins asked Hirsch the hard-hitting questions you would expect of future Pulitzer winners. [Not that we’re biased or anything.—ed.] They also tried to get free stuff because, you know, kids. The A.V. Club: Nina, why don’t you start with one of your questions? Theo: Whatever happened to the UFOs? Alex Hirsch: [Laughs.] Hey, great question! So, are you talking about the UFO that’s referenced in “Dipper And Mabel Vs. The Future,” that they go into underground? AH: The entire valley of Gravity Falls was formed when some sort of extraterrestrial object careening through the atmosphere went right through the cliffs, creating a perfect UFO silhouette, and crashed into the ground, creating a big, bowl-shaped valley. So for millions of years, probably even dating back to dinosaur-times, this giant, metallic ship has been underneath the town. So throughout history, as Gravity Falls has been settled—whether it’s the native populace or whether it’s miners or gold diggers or people paving railways—they have bumped into little chunks of metal because the UFO is still down there. I believe that one of the reasons Gravity Falls is such an unusual place, maybe part of the reason that the stoplights switch on and off at random times and cell phones don’t get proper reception and compasses spin wildly—is because of the strange kinetic influence of the UFO buried just underneath everyone’s feet. AVC: That’s so interesting. What stuff were you into as a kid that helped inspire you when you were making Gravity Falls? AH: When I was a kid, I was obsessed with UFOs in particular, and the paranormal. I grew up in the ’90s, which is when The X-Files was at its zenith. And I thought that was the coolest thing in the world, the idea of somebody trying to solve mysteries. I would see conspiracies in everything. I think I believed in leprechauns longer than any of my fellow classmates because I tried to catch them. It’s cool to have a chance to make all the things I loved be in a television show. And I’m glad that kids today are just as weird as I was when I was a kid. AVC: Speaking of: Nina, you had a really good question about those creatures. Nina: What creature from Gravity Falls would you love it if it was real? AH: Oh my gosh, there’s so many! I wish they were all real. I think the creature that feels most real to me is the gnome that Mabel meets in the very first episode, Jeff the gnome. Partly because he kind of looks like me—we have the same beard. AH: [Laughs.] Partially because he’s the leader of a group of other gnomes and he feels burdened by that responsibility and he’s always trying to be the best leader that he can but he’s constantly screwing it up. That’s a monster I can relate to. In terms of monsters that I wish were real, gosh—you know, I think if I could go through any of the episodes, a lot of them are scary and a lot of them would freak me out. I actually think it would be great to meet the old man and woman ghost from “The Inconveniencing.” Even though they were very scary in the beginning, when you met them, they were actually very friendly ghosts. I think if I had to meet a ghost, I’d be happy to go with them. AVC: … be the most scared of? AH: If I would be the least scared of the kindly old man and woman, I think the monster I’d be the most scared of? Possibly Bill, because he’s so unpredictable and he seems to take joy in frightening people. If I had to choose a second one, it would probably be the Shape Shifter from “Into The Bunker.” The Shape Shifter is a very scary character. Maybe our scariest. Even when I saw the designs for that character, it gave me chills. And when I read that episode: [Adopts Soos voice.] “Huh, good luck sleeping tonight!” That’s how I would feel if I saw that monster. AVC: Nina, your next question—isn’t it also about Bill? This is a good segue. Nina: Why is Bill so mad at the world? AH: Why is Bill so mad at the world? [Laughs.] I think there’s a lot of people where you can ask, “Why are they so mad at the world?” I think Bill is angry at the world for the same reason that anyone sometimes can get mad at the world. Everyone has days where they don’t get their way, where you have to go to bed early or you have too much homework to do or you can’t eat the candy that you want or you miss your favorite TV show and, in those moments, you just want to tear the whole world down. Bill is a character who has been around for countless billions of eons, but he hasn’t grown up in that time. He’s a character who has accumulated many frustrations, many moments of destruction like that, and they’ve built up over time. Now he’s decided that he wants a world where there is no homework, where there is no bedtime—where you can eat any candy you want, and you can do anything you want. But because he is such a crazy guy, when he does anything he wants, it turns out to be terrifying. So I think little frustrations over thousands of years have built him into a sort of spoiled brat. And he takes it out on the world, and it’s up to our heroes to finally teach him some rules. 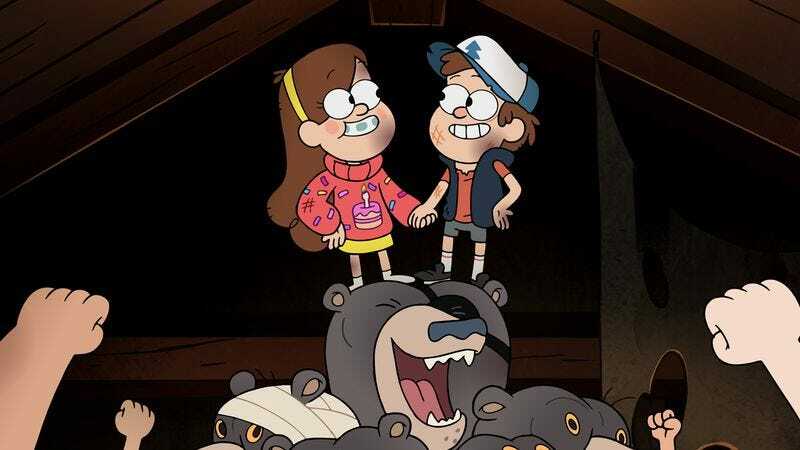 Theo: What happened to Dipper and Mabel’s parents? AH: That’s a great question. Dipper and Mabel’s parents—not a lot about them is revealed on the show, and I don’t want to spoil anything. But I will say that Dipper and Mabel’s parents have been, this entire time, hanging out in their hometown of Piedmont, California. They are, for the most part, blissfully unaware of how insane the summer is. Dipper and Mabel’s parents thought that they were sending their kids to go spend the summer with their brilliant scientist uncle who was an accomplished scientist and a responsible man. They thought that Stanley was Stanford, so they didn’t fully realize who they were putting this kid in the hands of. As far as Dipper and Mabel’s parents know, everything is fine. Mabel has sent a number of letters back home—“Dear Mom and Dad, I saw a unicorn today.” The parents are very familiar with Mabel’s vivid imagination, so they think it’s cute. They put it with the fridge magnet on the fridge and then they forget about it. They are waiting for their kids to come home and have no idea what is going on. AVC: Speaking of Mabel, I love following you and your sister Ariel on social media. You guys are kind of my role models for raising boy-girl twins, because you seem to have such an awesome relationship. AVC: Were you guys always best friends, like Dipper and Mabel? AH: [Laughs.] No. I would say one of the tough things is: A sibling is a friend for life, but they are a friend for life that you are forced to have. And like anything that you are forced to do, occasionally people will drive you crazy. Your family, even though you love them, they can get on your nerves. You spend so much time together. When me and my sister were probably in elementary school, we really were, I think, good friends. And as middle school came about, we started to get older, we started to develop our own lives. I think twins can sometimes be shoved into the same mold and they can start to feel like they’re not being given a chance to develop their own identities. I think it was very important to us in middle and high school that we had our own groups of friends and that we had our own interests. My mom intentionally separated us in school because she wanted to make sure that we didn’t just hang out with each other. The great thing was, by the time we got to the end of high school, we had kind of created our own personas and had our own friend groups. Then, in senior year, we combined our friend groups to create a giant Hirsch dynasty. We made up a fourth of the school at that point. We were able to combine our powers. I would say, as a parent, what my mom did was: She loved us unconditionally. She supported our interests. And she always talked with us as individuals and never just lumped us together as the same person and encouraged us to find out who we really were. I’ll always be grateful for that. AVC: That’s such good advice. I hear that about twins a lot. Theo: If I guess Dipper’s real name right, will you give me a free copy of the third journal? AVC: [Shocked.] Where did that question come from?! AH: That’s a great question! All right, if you guess Dipper’s name properly, I will give you a copy of the third journal. I can’t say now if you’re right, but you can tell me what you think it is. Theo: I think his name is Abraham. AH: That’s an interesting guess. We’ll find out at a certain point. If that’s right, you get a free copy. If not, you might get a free copy anyway, because I like you. So we’ll just have to wait and see. AVC: We also wanted to ask you what your favorite episode was. AH: Gosh, you know, it changes every day. Every episode has sort of a different thing about it that I love. I’m actually curious, before I answer that question: Do you have a favorite episode? AVC: You guys, what are your favorite episodes? Nina: I have no idea! AVC: I love the boy band one, and I love that you dedicated it to your sister. As a former boy band fan, I really enjoyed that, and the music was great. AVC: Yeah, “Weirdmageddon,” the imagination present in those episodes is off the charts. It’s spectacular. AH: I think an episode that’s very close to my heart is “Dipper And Mabel Vs. The Future,” where they finally sort of have to confront that difficult question of how you grow up, how do you change without changing too much, how do you grow up without growing apart. That comes very directly from that experience of that age, of trying to figure out what does it mean to grow up. That episode, I think, speaks a lot to the whole psychology of the characters and kind of the real meaning of the series. I’m pretty satisfied with how that one came out. AVC: And you’re working on something new, now, right? AH: Yeah, I’m at the very, very front end of several secret projects. Like Uncle Stan, I try to be a man of mystery. I try to keep the various projects I’m up to as close to the vest as possible until it’s time to reveal them. Rest assured, I’m a very relentless individual and have a lot more insanity coming. Hopefully fans of Gravity Falls will like some of the things that will come from me next. Theo: My friend told me about this beef thing—it tells you secrets about Gravity Falls or something. AVC: They also have a theory that Wendy is a mermaid. Nina: I never agreed to that theory. Never! AH: It’s not a bad theory. Ariel, the Little Mermaid, has red hair, and Wendy has red hair as well. When it comes to those kinds of theories, I prefer to not say “yes” or “no” because I like fans’ interpretations. I think some things are best kept a mystery. I encourage anyone to imagine their version of the series. I can be a fan of the drawings and stories that the fans create. It’s fun for me, too. Theo: Speaking of Wendy, whatever happened to Wendy’s mom? AVC: Does Wendy have a mom? AH: Wendy’s mom—That’s one that I can’t answer right now. But you’re a perceptive viewer for asking that, and maybe one day, you’ll get an answer.